Hauskaa lauantaita, maailman askartelupäivää vietetään tänään. Minä ja kamut juhlimme askarrellen Heinolassa. Tervetuloa viikon Allsorts haasteen pariin! "Luonto" aiheella mennään nyt! 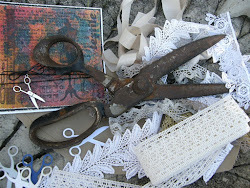 Hi; Happy Saturday and World Crafting Day! It's time for a new Allsorts Challenge! "Nature" is the theme. 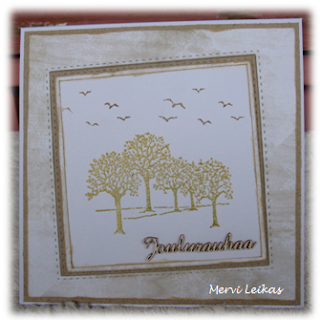 A lovely clean crisp and elegant card Mervi. Beautiful card, both time, gender and age neutral, lovely! A very classy and elegant card Mervi! Like the stitching detail, The paper you chose for the frame & mat and the added line on the image panel to simulate a 2nd mat! Thank you for sharing your project and creativity with us at Aud Sentiments for our Christmas challenge! 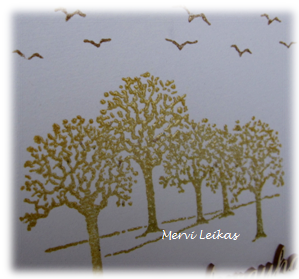 Love the use of the gold on the trees, a wonderful card. Beautiful card! Such a lovely design!! Very pretty! What a lovely, classically elegant card. The gold embossing is a great touch. Thanks for sharing it with us at Aud Sentiments, good luck and hope to see you again in our next challenge! Fabulous creation, love your design, so lean.